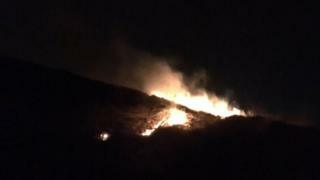 A large moorland fire in Greater Manchester may have been started deliberately, the fire service said. Fire crews and a wildfire unit were called to Crompton Moor in Oldham at about 20:20 GMT on Saturday. The blaze covered about 400 sq m of moorland but was a mile from the nearest properties, Greater Manchester Fire and Rescue Service (GMFRS) said. It was extinguished on Sunday morning and is "being treated as possible deliberate ignition", GMFRS added. The fire service tweeted thanks to everyone who notified them about the fire. It said the blaze had continued through the night and firefighters had returned to the scene to "put out the rest of the flames".